In Tomamae-cho, Hokkaido, about 10% of the population of 3,200 are employed in the fishing industry (2010 census). As with the trends for Japan as a whole, the fishing industry in Tomamae is in decline, experiencing a reduction in catches, an aging of the workforce, and a lack of new interest in the industry. 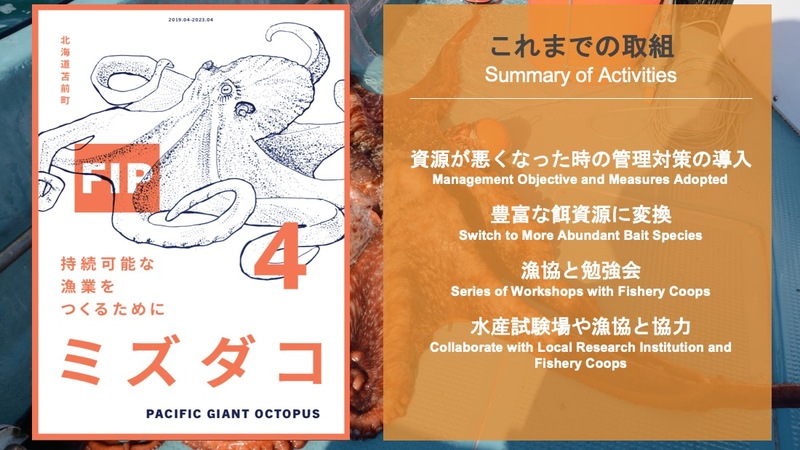 The Tomamae Giant Pacific Octopus FIP aims to revitalize the region’s fisheries by improving sustainability of fishing practices through the establishment of a science-based management plan for the octopus fishery, which is managed by the Kita-Rumoi Fisheries Cooperative. In addition to the environmental work, the group of barrel drift fishermen involved in the FIP want to use the project as a vehicle to generate further interest and investment in the region’s fisheries. Convening fishery stakeholders to generate support, participation, and funding, including matching funds and in-kind contributions, for improvement efforts. Conducted a rapid assessment of the fishery to identify priority environmental challenges, including a harvest strategy without catch limits or harvest control rules and no clear consideration of fishery impacts on bait species. Development of a FIP workplan to address the concerns found during the rapid assessment. The workplan includes plans to transition to more robust and routine stock assessments, understand and manage the bait species, and develop and implement a precautionary harvest strategy. Volume: 51 mt - Based on the fishery catch data provided by the Kita-Rumoi Fisheries Cooperative, which manages the fishery, the average annual catch from 2010 to 2016 in this region was 51 mt. For any recent news on this fishery project visit our blog. This FIP is tracked publically in its entirety on FisheryProgress.org, see the Tomamae Giant Pacific Octopus FIP profile here.